In the age of increasing use of smart technologies, it’s important that vehicle technology continues to develop as well – and more than entertainment. This continued process of upgrading and integrating new technology makes the driving experience much more convenient and enjoyable for Moose Jaw drivers. Nissan provides Waycross drivers with an abundance of high-tech features to choose to equip their vehicles with. With everything from comfort-enhancing to safety and security technology, Nissan vehicles take the future of driving into their own hands. Learn more about just a handful of these features by checking out the list below. Predictive Forward Collision Warning – Taking every precaution possible to avoid an accident is even easier with the help of technology designed to alert drivers when there is the potential for a forward collision with suddenly decelerating vehicles ahead of you. This feature is a common one on Nissan vehicles and can be found on the 2016 Rogue, the 2016 Altima, the 2016 Maxima, and more. Nissan Advanced Air Bag System – With dual-stage supplemental front airbags, seat belt sensors, and an occupant-classification system, Nissan vehicles can better determine where to focus airbag deployment. 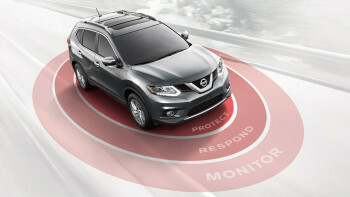 Available on many Nissan models, this feature is ready and willing to keep Swift Current drivers safe. Adaptive Headlights – Adaptive headlights give drivers one less thing to think about when driving in dark or stormy weather conditions by sensing when there is low visibility and atomically triggering the headlights in response. This feature comes standard on all Nissan models. Parking Sonars – With the assistance of front and rear sonar systems, parallel parking is a walk on the beach. The sonars work to detect how close a stationary vehicle is in relation to yours, to assist you with getting into and out of tight spaces. This feature is commonly available on vehicles like the Pathfinder, the 2016 Murano, and many other Nissan vehicles. Intelligent Cruise Control – The days of traditional cruise control are over with Nissan’s intelligent cruise control which works to keep a set following distance between your vehicle and the one ahead of you, instead of one constant speed. This helpful feature can currently be found on the 2016 Sentra. Don’t stay trapped in the past when the future of technology is just a quick trip away. To explore some of the interesting and high-tech Nissan vehicles for yourself stop by Knight Nissan of Swift Current and are on standby for questions, comments, or even to schedule your test drive today.